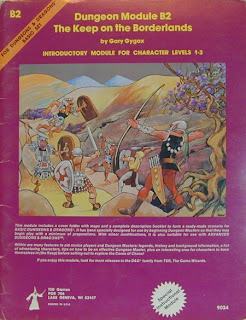 Although I contend that The Village of Hommlet, about which I've already written a retrospective, is the greatest exemplar of Gary Gygax's remarkable skills as a designer of adventure modules, I recognize that this is a minority opinion. There's a peculiarly large contingent of gamers who dislike module T1, a sentiment I find baffling. Far more gamers, if asked to choose their favorite Gygax-penned module, would choose The Keep on the Borderlands. To some extent, I suppose such a choice is inevitable, given that module B2 was packaged with the Moldvay Basic Set, through which perhaps more gamers entered the hobby than any other. For these gamers, The Keep is where they first took up their swords and donned their shields in defense of the Realm against the depredations of Chaos. It's a touchstone for an entire gaming generation in a way that the better-crafted Hommlet is not. This isn't to denigrate The Keep on the Borderlands, whose purpose is much different than that of T1. It's quite explicitly intended, like its predecessor In Search of the Unknown, to be an aid to the novice referee. That's why so many of its 32 pages are devoted to advice and suggestions on running the module and on the art of refereeing D&D. I'm frankly torn in my estimation of B2's success in this regard. On the one hand, it's a lot more structured than B1, with both the eponymous Keep and the Caves of Chaos thoroughly "filled in." On the other hand, this structure might be better suited as a tutorial than is B1's open-ended approach. It's hard for me to judge this, since I came to The Keep on the Borderlands after playing the heck out of In Search of the Unknown for many months. My feeling then was that B1 was too "kiddie-fied," which led me to mistakenly turn my nose up at all subsequent B-series modules until I could be convinced that they were "proper" D&D modules. Still, there's a great deal to like here and I certainly had my fair share of good times refereeing this module. Morgan Just made his first appearance as a PC in B1, after the death of his ill-named predecessor Hercules (at the hands of fire beetles, no less). Likewise, the Mad Hermit of the surrounding wilderness became a minor patron/villain for later adventures, something the module itself suggests as a possibility. Likewise, the Keep served as a home base for many levels and Muntburg from my Dwimmermount campaign is at least partially inspired by it. There's no denying that there's something extraordinarily primal about The Keep on the Borderlands. Gygax was always very good at setting a scene and the scene he sets in this module is a potent one: a lonely bastion of Law, defending the Realm against the creeping hordes of Chaos. In many ways, that's the most archetypal description of Dungeons & Dragons ever written. It sums up the game very succinctly and yet in such a way as to leave lots for the individual referee and player to imagine for himself. Whereas B1 is about a dungeon without much context, B2 presents us with a world, one to which even the Caves of Chaos exists in relation. It's a sketchy world, to be sure, but it's a world nonetheless. Perhaps it's this implied expansiveness that makes The Keep on the Borderlands so powerful even after so many years. Its lacunae open up entire fantastical vistas into which our imaginations can expand. I'm glad to see you liked T1; I think it's one of the best modules written for any version of D&D, and I've used it as a gateway for not only fantasy campaigns but (modified) for science fiction games, too. Borderlands has the distinction of being one of the few modules I've both played in and DM'd. From each angle I enjoyed it immensely, though the keep community struck me as too simplistic. It really does have that flavor of 40s and 50s fantasy literature however. I'm not sure why, but I think of Fletcher Pratt when I think of this module. When tasked with grabbing an adventure with next to no notice in order to DM a game for some novices, B2 is perfect. It's the very first module I used as a DM, and it's the most recent one I used as well. I'm surprised you hadn't done a B2 retrospective until now! More than half of the sessions I ran using B2 took place entirely outside of the Caves of Chaos. I like that aspect of B2. There's no denying that there's something extraordinarily primal about The Keep on the Borderlands. This. Hommlett may be more involved in it's intrigues, but that's not always a good thing. The Keep just is. Saddle up and ride out. Plus, I too always found the Mad Hermit too appealing to leave alone. I think the last time I thought about him, I was making him the disgraced former High priest of Evil Chaos. It was also in the Holmes boxed basic set (Editions 6/7 in 1979, per Acaeum). And, hey: Erol Otus cover art. I think it's mostly that, while I do like the module a lot, it's not one of my favorites, so it was never foremost in my mind when I planned out the retrospectives I'd be writing. That's true, although my copy of Holmes came with B1. Isn't that a painting by Roslof? By the time B2 came out, I had already 'graduated' to AD&D (I cut my player adventuring teeth on B1 and mazes composed from the Monster & Treasure Assortments and geomorphs that came with early boxed sets). I still, to this day, use the sample characters in the back of B1 as NPCs --- Mohag the Wanderer, Eggo of the Holy Brotherhood, Trebellos, Glom the Mighty, etc. When B2 came along, I was already deep into making my own adventures and looked down my beaky adolescent nose at 'prefab' adventures. As a player I loved 'The Village of Hommlet' since it was the first town we ever adventured in that seemed 'real.' The bad thing was that after waiting and waiting, we never got T2. I made my own, based on hints in T1. The Elder Elemental God (in my version) was a 4 armed god who had the powers of fire, air, water and earth (which would probably add up to hot, windy mud). The cover is indeed by Jim Roslof. D'oh! Was posting at the last minute before running to class. Mea culpa. I'm one of those who prefer B2 over T1. And I like B1 better than any module other than Gary's D trilogy. Man, I can't tell you how many times I've mistaken one for the other. In fact, I was convinced at one point that EO did the art for the Dungeon! board game. I think it's because they both have a similar sort of psychedelic style, but there are enough differences as to be uniquely each their own. The back cover is Otus. In hindsight I am surprised that so few modules attempted the multiple entrances structure of the Caves of Chaos. @Jeff: I think it's because the linear dungeon became so popular. The first thing I do when prepping most post-1982 dungeon modules is to open them up. I like B2 a lot, but it actually feels *very* different from the rest of the B-series line. Kind of a different setting; less about Exploration and much more about Law vs Chaos. Kinda Moorcock/Anderson. I suspect it informed GW's Warhammer line. My current 3e campaign leans heavily on the pre-Karameikos Basic modules, but I had to leave out B2, it just didn't fit the way B4, B5 and B7 did, or B1 and B3 would. I think of Borderlands as more then just a module, I think of it as a right of passage! I know it may sound snobbish or elitist of me to say, but I consider younger D&D fans to be complete virgins, until they popped their gamer carry with the good ol' Borderlands, or had sipped bravely from the magic pools of B1! I can't think of a better intro module than B2 for both new players and a new DM. I started with it (after using the sample dungeon in the Holmes blue book) and I think it perfectly captured the mood of the game. It certainly hooked me! My own copy of B2 has fallen apart from reading and re-reading over the years. The fact that it gives us a setting and a conflict of ultimately epic dimension all in a few pages is part of what appeals to me, and Gary's brief explanation of the Realm of Man, hemmed in on all sides by Chaos, has always been an inspiration to me. I wonder, James, if some of your reticence about this module would have been cleared had it been reversed in order with B1. That is to say, Keep would have provided a simple world, some practical advise, and a structured module for the beginning DM, and then Search would have provided the next step in the referee's training by providing a dungeon that the DM would have a hand in populating. (slap my own forhead) Doh!